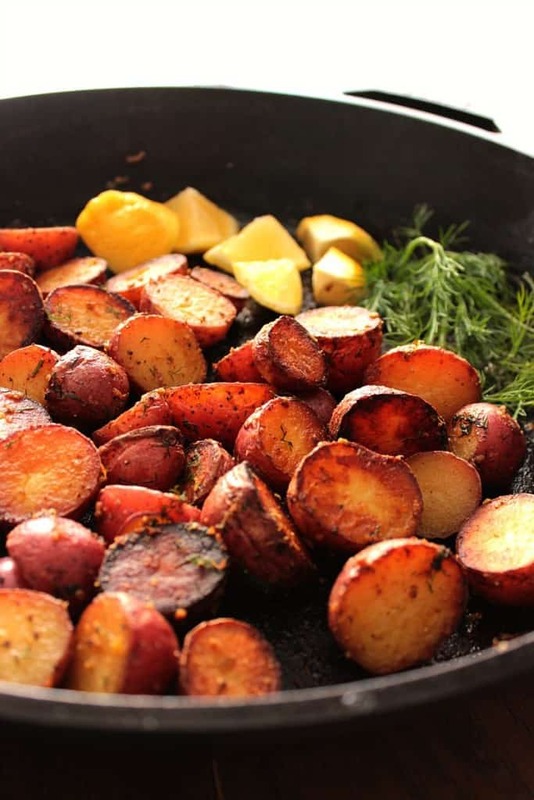 This easy braising technique of cooking red potatoes will ensure their crisp and flavorful outside and their wonderfully soft and creamy inside. 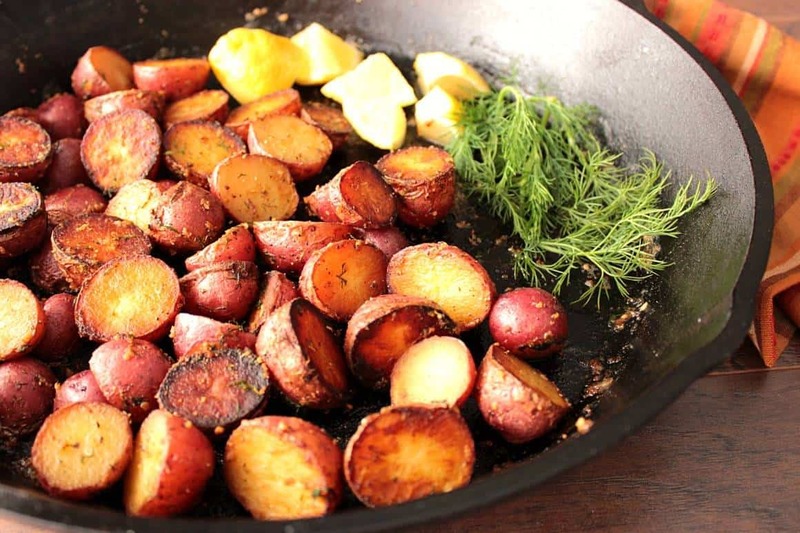 Braised Crispy Red Potatoes with Lemon Dill Sauce. 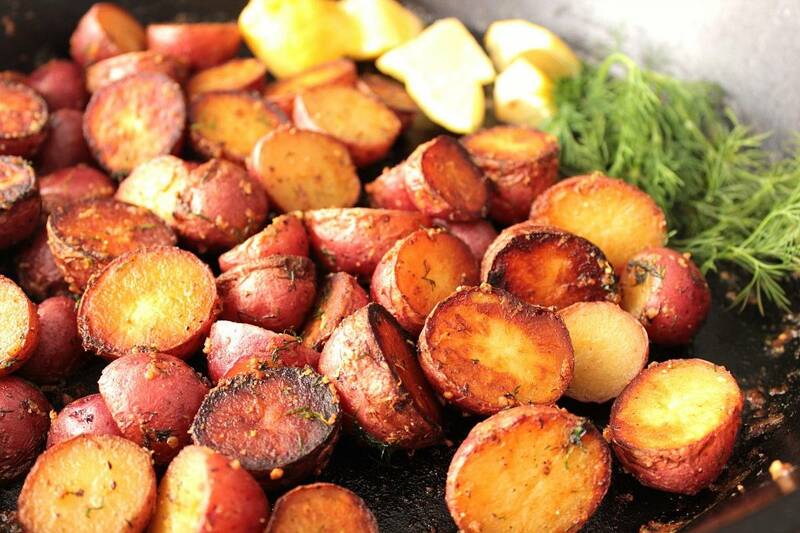 The thing that I did differently than what I saw on America’s Test Kitchen was that I used dill weed flavor the potatoes during the cooking process, and again as a garnish upon completion along with some lemon juice and lemon zest. This braising technique for red potatoes is quick, flawless, and ready in under 30 minutes. 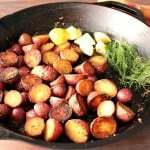 This easy braising technique of cooking red potatoes will ensure their crisp and flavorful outside, and their wonderfully soft and creamy inside. 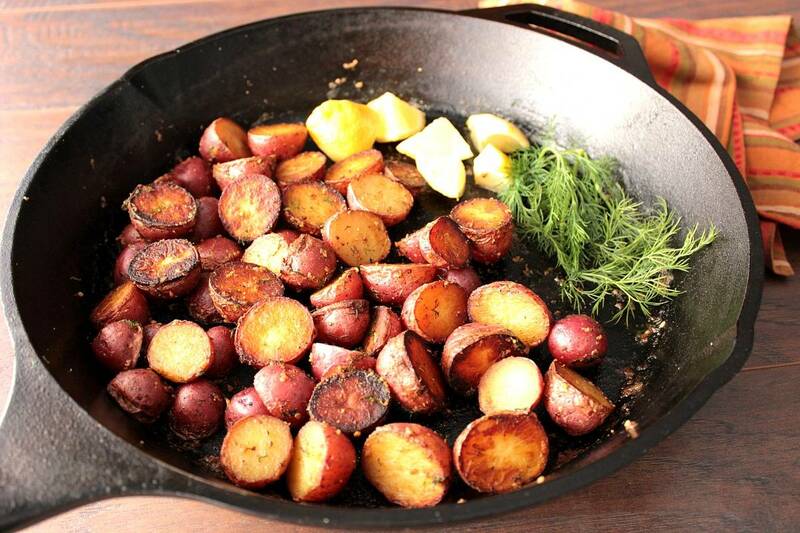 Place the potatoes in an even layer, cut side down, in a large skillet. Add the water to the skillet along with the salt, butter, 2 dill sprigs, and garlic. Cover the skillet and bring to a boil over medium/high heat. Cook for 15 minutes. 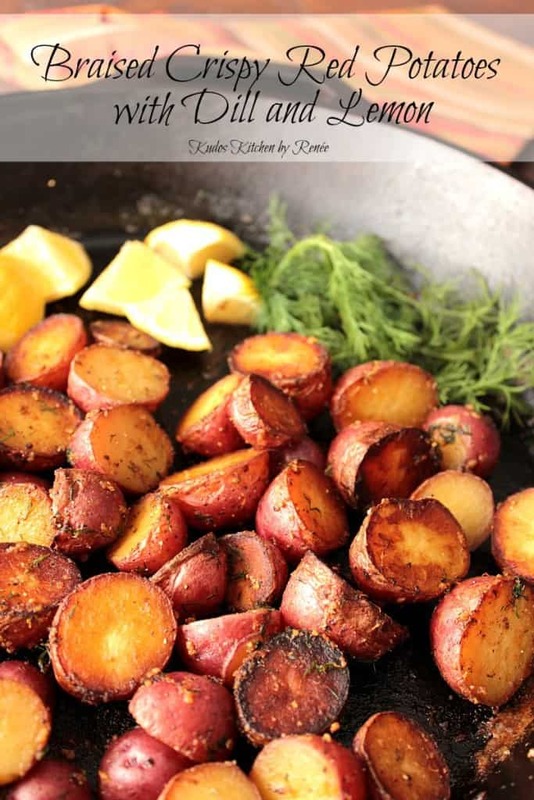 Uncover the skillet, remove the dill, and continue cooking the potatoes for an additional 10 minutes until the water evaporates and the potatoes sizzle in the butter remaining in the pan. Check the potatoes occasionally to make sure they're not sticking, and continue browning the potatoes until deeply golden in color. Add the lemon zest, lemon juice and additional chopped dill if desired. If there’s ever anything I can paint for you, from glassware to fabrics (aprons and tea towels), please don’t hesitate to contact me or visit my shop on Etsy or Wazala (the links can be found in the navigation bar). Custom orders are always welcome, and I will happily design and paint from any photo or description you send my way. Oooo! Those crispy potatoes have me yearning to crunch into the invariably creamy centers. LOVE this method! I can never turn down a crispy potato dish! Loving the lemon, dill combo! Oh MY they seriously do look like the best crispy potato ever! Drooling! I haven’t had potatoes likes this in forever! 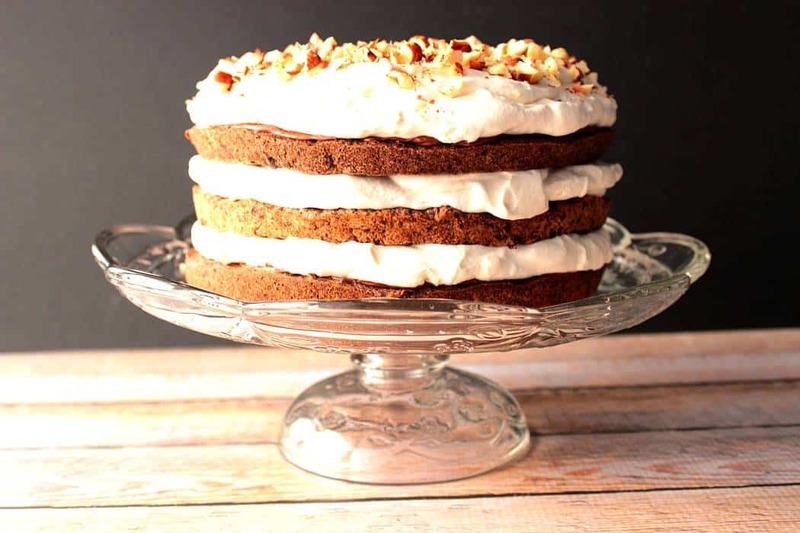 I’m going to have to make this for dinner sometime this week! What a great way to make potatoes! I am going to try this soon! I just got some red potatoes in my farm fresh delivery this week! Can’t wait to try this recipe! I can’t wait to try this! I usually roast my potatoes but have never thought to braise them. They look delicious! I love the crisp you got on those potatoes. They are perfect. These sound so crispy and delicious – perfect comfort food! Crispy potatoes are my favorite potatoes! 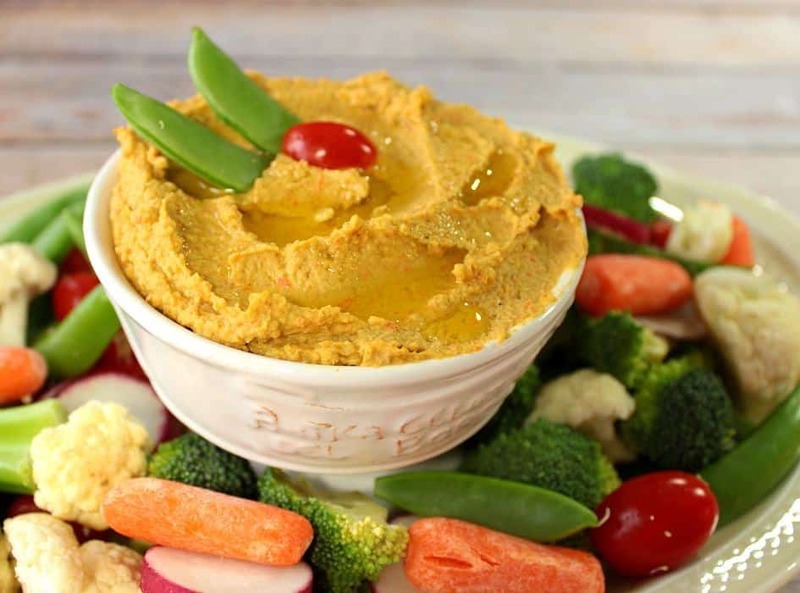 Plus that addition of lemon and dill – perfect! 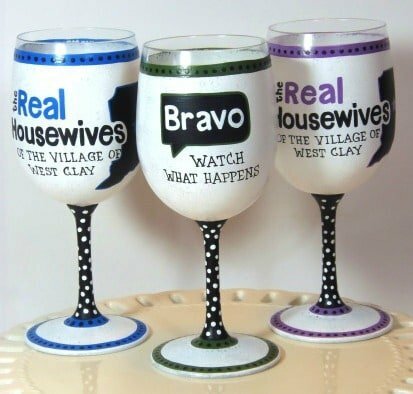 These are drop-dead gorgeous! I couldn’t live without potatoes, especially crispy ones like these, they’re absolutely perfect!! I don’t think I could live with out potatoes either. Well, maybe I could, but I just wouldn’t want to. Thanks, Kimberly!